Do you remember when we were buying a crib for our baby? We went with a very specific type in order to save us money long term. It was good planning, but what we didn’t know at the time was that we would be living in two separate houses by the time we really needed to upgrade our youngest’s bed situation. While the convertible crib/bed is still at dad’s house, I recently had to upgrade my child from a toddler bed to a big-kid bed in my own domicile. I was a little bit worried it was going to be crazy expensive, but luckily, I was able to complete the project for under $250. Here’s how that worked. I looked for a bed at the garage sale we went to this spring, but the only thing people were selling was toddler beds. Oh, the irony. So I went to that place where all shoppers seeking cheap furniture go: Ikea. 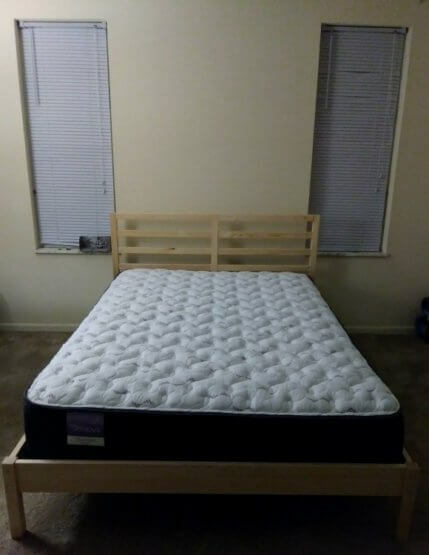 I found a double bed including the wooden slats that substitute for a box spring for about $197. When I got it home, the Ikea instructions said I would need two people to put the bed together, but I just had me. 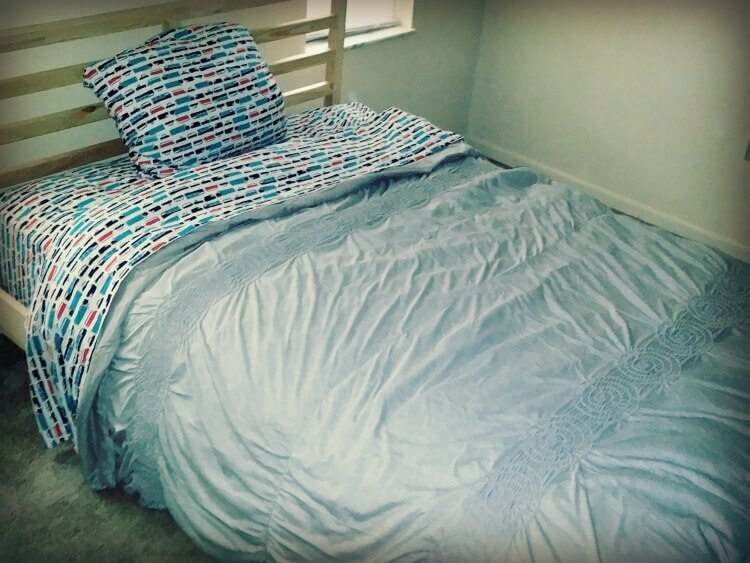 Determined to prove the pictorial manual wrong, I successfully built the bed solo. Because I have mad mom power and am just really good at putting things together period. A few years ago, we got a king-sized bed from Mattress Firm and loved it. It’s pretty darn firm, which is exactly what we needed. We loved it, and I see it lasting for many years to come. We needed something different for the child’s needs, though; we were looking for something plush. 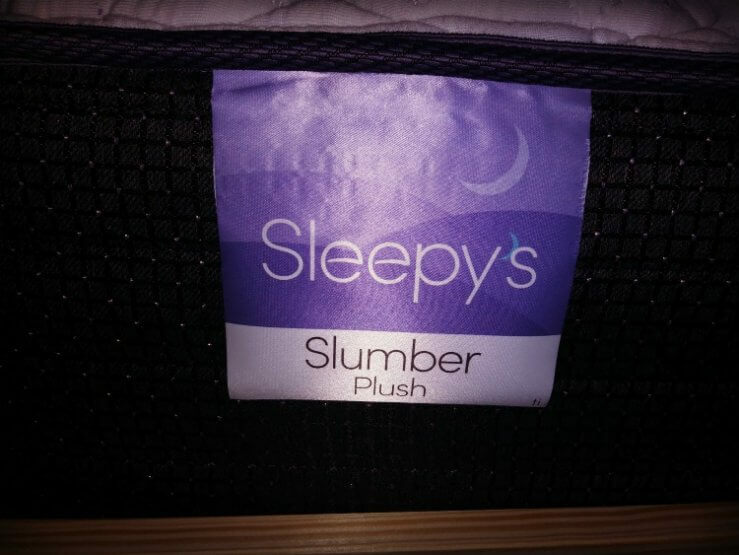 I was thrilled when Mattress Firm offered to send me a full-sized Sleepy’s Slumber Plush for review purposes. The kiddo was so excited when they saw their new mattress. As the name indicates, it’s incredibly plush–like sleeping on a cloud. It was a real treat for them after they had been complaining of discomfort from the toddler mattress. I wasn’t kidding! It even LOOKS like you’re sleeping on a cloud! 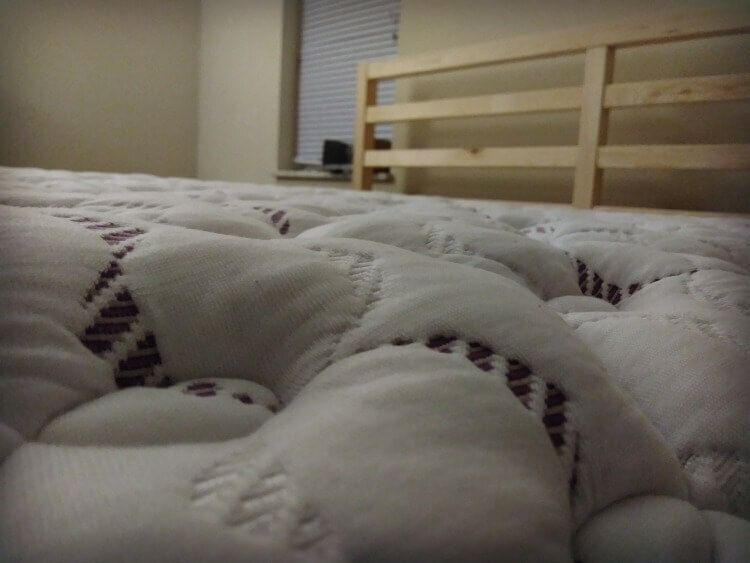 I know I’m incredibly fortunate to have gotten a mattress for free, and that it’s not something you’ll be able to replicate. However, over the years I’ve found Mattress Firm to not only sell great products, but to sell them at great prices. For example, right now you can get a mattress for a heavily discounted price during The Big Price Drop. All mattresses are priced down a size, so if you bought a king, you’d only pay for a queen. If you bought a queen, you’d only pay for a twin. That’s a crazy amount of savings on a great product—hop on it while it lasts! I got some super cute sheets from Target for the bedding. They cost $30, but I had a $25 gift card bringing the grand total down to $5. I’m in the process of making them a quilt from clothes they have beat up and outgrown, but it’s not quite finished yet. The only cost on that should be the backing material and the batting. Since I’m not done, kiddo is borrowing one of my duvets for the time being. But expect an update on that quilt soon! Kids are so expensive. But there are ways to cut those costs down. While the convertible crib was plan A, I was able to keep things affordable by shopping at Ikea as plan B. The mattress needed to be quality as they’ll probably have it until they’re 18 or older, so I wanted to make sure I didn’t skimp. I was fortunate to work with Mattress Firm, and the reason I’m doing so is because they can save you a ton of money while providing you with a quality mattress to boot. Be sure to take advantage of their Labor Day Sale—you’ll get way more than what you pay for! By shopping with a gift card and putting my basic sewing skills to work, the bedding will come to under $30 by my current estimate—which is pretty fantastic considering the sheets alone cost that much without the gift card. On top of all this, my child is excited. They have a super comfortable big-kid bed with sheets that express their interests. The complaining about the discomfort has stopped since we switched out of the toddler bed. It’s nice to know that this big expense is out of the way for years to come, and that the kiddo will be having sweet dreams all the while. How did you update your toddler’s bed? Have any extra frugal tips? This entry was posted in Family Finance, Ways to Save Money on August 29, 2018 by femmefrugality. This is great – but (1) lots of us don’t live near an Ikea and (2) you could have gotten a box spring, mattress and frame without a headboard and been just fine. Do love your quilt idea though! Hi, Linda! Thanks so much for your input/ideas! I’m sorry you don’t live near an Ikea. I imagine you could have it shipped, but I also imagine that shipping would cost a small fortune. Will be sure to post the quilt when I get it done–turned out to be a huge project! I know I shouldn’t be surprised haha. LOVE Ikea! So many amazing options for such low prices. 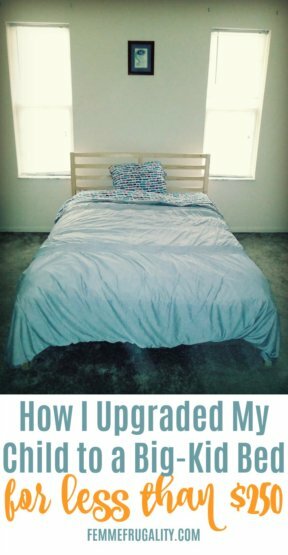 Upgrading beds is such a headache lol, but I’m so happy you were able to make it cost effective! IKR? And thank you–glad it’s one headache that’s over and that they’re nice and comfy on that plush mattress now!! !